It’s been an interesting few months talking to football clubs as they adopt the ithlete Team App, but as Clubs in the UK move from pre-season to the first critical games the questions and needs for the teams of all levels are suddenly changing. Put simply the ithlete Team App will allow any coach to take a group of 20/30 plus players for a session in the knowledge that each player is in the correct physical state to gain from that training, having reliably assessed their personal data before the session starts. Most importantly it allows him to identify in seconds any players in the group who should not train hard that day to avoid increasing their chance of injury. Simple but very effective, I spoke to a Championship club recently because they had just cancelled the last double session of pre season. The fitness coach did this on the basis of a changing room discussion where a number of players felt fatigued. Good feedback no doubt but as we then discussed, having a morning heart rate variability (HRV) from those players to see this scientifically may have allowed a different and more effective training pattern. Rather than cancel the training session could it have been adapted to their current readiness to train? Almost certainly! Were all those guys too fatigued? Or could a small change to the training pattern that week based on individuals lowered HRV allowed a tougher double session end of week with the result of increased fitness? Without reliable and accurate physiological data the coach had to make a judgement call on the state of the team as a whole. I also listened to a fitness coach of another sport discussing their International side. They operate the ‘Red Zone’, this put simply is when a player completes a certain amount of activity within their sport and only at that point they are rested. How do we know reliably they need to rest or should they have rested prior to hitting the red zone’? I see that Teams have spent enormous amounts financially on the monitoring of the ‘’training session and the game’’ but don’t fully consider whether the player is in the right place to ‘’Train or Play’’ which to me is far more crucial! 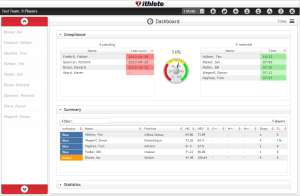 The ithlete Team App allows coaches to make those decisions easily and quickly based on objective physiological data. Looking to the new season suddenly the coaches I’m talking to are looking to the ithlete Team App to monitor both the players tapering towards games and also injury support/prevention. One of the clubs is particularly concerned with injuries having had a difficult season last year, especially in reference to some of the older players. They are looking to ithlete to conveniently and reliably monitor those players in view of them playing 2 games per week and the effect that is having on them. Using this individualised information is already allowing teams to see the benefits of using ithlete HRV monitoring to adjust training loads appropriately and maximise fitness ahead of games.